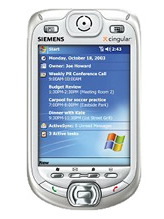 Cingular today launched the Siemens SX66, a high-powered pocket PC smartphone. MobileTracker noted last month that Cingular had been advertising this phone in a mailer to customers, though a launch date was unknown at the time. Features of the Siemens SX66 include: * Windows Mobile OS * 32-bit Intel PXA263 CPU, 400 MHz * Quad band GSM * Wifi/Bluetooth/IR * 240 x 320 pixel touch sensitive TFT with 65K colors * Mini slide out keyboard * MMC/SD cardslot Cingular is charging $549.99 with a 2-year contract for the SX66.